Jill worked at the King County branch located inside the Juvenile Detention Center in Seattle. 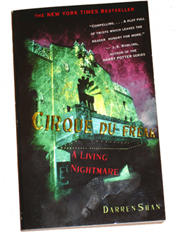 She discovered that kids enjoyed Cirque du Freak, a series of novels about a vampire underworld. The Detention Center kids, locked up alone in their cells each night, read two and three volumes of the series at a time. Unfortunately the last volume of the 12 books series had not yet been published. A patron, upset by having to stop at volume 11, ripped the book into pieces. Jill put the pieces into an envelop along with a letter to the author, telling him how much the kids loved his work. He wrote back, saying he was planning a book tour and had added the Detention Center to his list of stops. Hearing this news from Jill, a patron was so excited that she said, "I want to shake his hand. If I'm released before he comes, I'll go get myself arrested so I can be there."